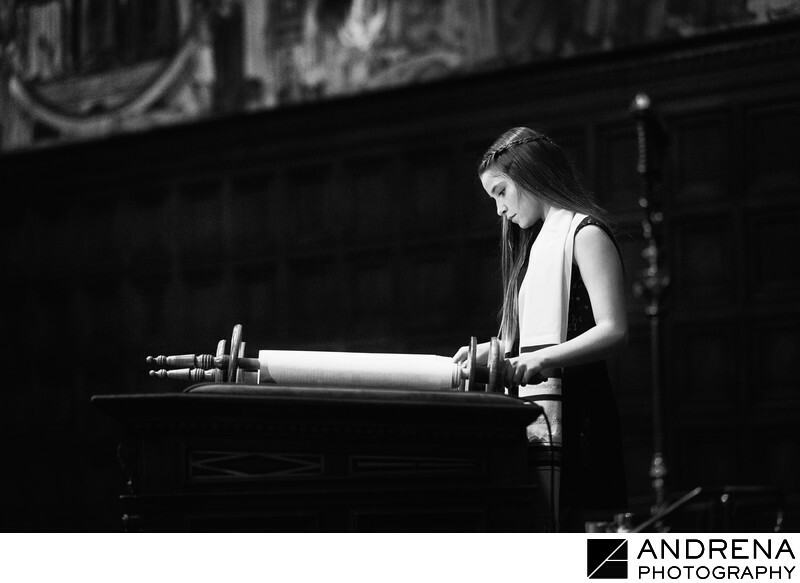 As experienced event photographers, we know that a Bar or Bat Mitzvah is primarily about a child's commitment to the teachings of the Torah, and a photo like this on the bimah at Wilshire Temple is a beautiful example of capturing the essence of the day. The timeless black and white processing of this portrait provides a dramatic nod to the far reaching roots of Jewish tradition. The girl's youthful image bathed in beautiful light, paired with the ancient solemnity of the scrolls before her, provide both a contrast and a oneness befitting the occasion. The Wilshire Temple is a particularly stunning place to have a mitzvah. Its grandeur and beauty provide an absolutely stunning background to Jewish events of all kinds.